The SceneVegetationBaker component is a utility component designed to allow users to bake the content of a persistent storage and run-time spawn rules to gameobjects in the scene. Add the component to the GameObject that has the VegetationSystem component. 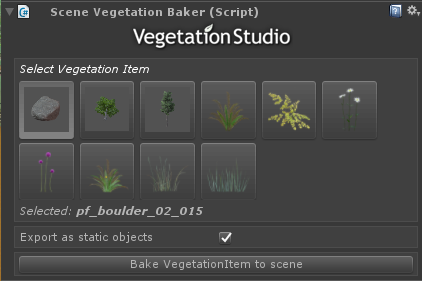 Select the VegetationItem you want to bake and press the button. There is an option to export this as static objects. Enabled by default. The exported objects are all placed under a common root in the scene. This could be used if you want some Vegetation Studio controlled objects to temporary be used for baking lighting. Then removing after.